Mayor Steve Callaway discussed diversity and economic development during his annual address. 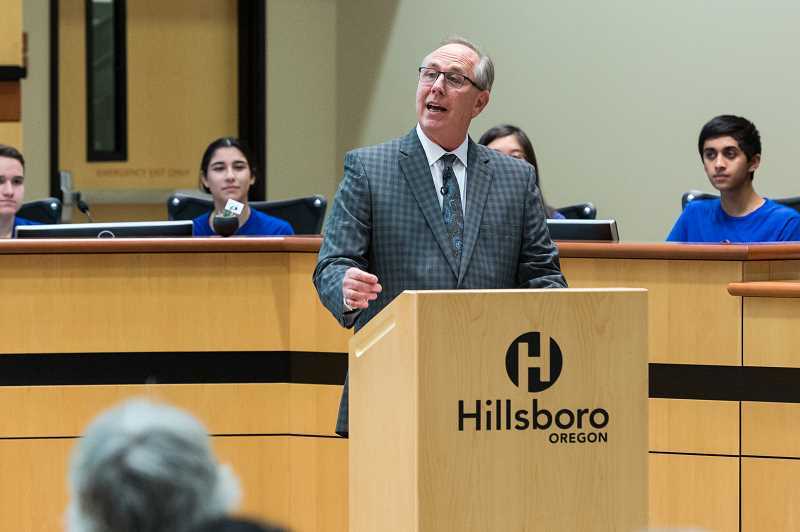 On the same night U.S. President Donald Trump addressed the nation for his innaugral State of the Union address, Hillsboro Mayor Steve Callaway stood before a packed crowd in the Hillsboro Civic Center for an oration of his own. Wrapping up his first year as mayor for Washington County's largest city, Callaway addressed the crowd about the accomplishments the city has made over the past year, and the work needed to tackle issues in the future. A common tradition among mayors, Callaway's "State of the City" presentation skewed more toward the comedic. Tuesday's speech offered plenty of jokes, fist bumps and even a skit from former Hillsboro Mayor Jerry Willey, who arrived in costume as a pizza delivery man. "This is a very special 'Callaway pizza,'" Willey joked. "It's extra cheesy, has a thin crust and is really cheap." Self-deprecation aside, Callaway said that Hillsboro faces unique challenges as one of the most diverse cities in Oregon. Last year, city councilors declared Hillsboro a "sanctuary city," a symbolic designation aimed to tell the city's large immigrant population the city stands with them, no matter their legal status. Callaway, who cast the deciding vote on the issue, said growth and diversity will be in Hillsboro's future for years to come. "How do we make sure everyone feels welcome?" he asked the crowd. "How do we treat those whose appearance, language or faith traditions are different from ours, or are unfamiliar? First, we can be clear: All are welcome here. All are welcome here." Already a major hub in the Northwest's "Silicon Forest," Callaway said the city will continue to bring new businesses to the area. Later this year, Callaway said, Edwards Vacuums will move its national headquarters in Hillsboro. The company — which makes vacuum pumps for semi-conductors and LED displays — is currently based in New York and plans to expand to nearly 200 employees at its Hillsboro site. Callaway said economic development is a major goal for the city. Last year, Callaway and the city took special interest in SolarWorld, the nation's largest solar panel manufacturer. The company, based on Evergreen Road, laid off hundreds of its employees last year citing a flush of cheap products from Chinese competitors and petitioned the federal government to impose tariffs on foreign-made solar cells, in order to compete. "The city supports the efforts of major employers to protect workers' jobs," Callaway said. Callaway flew to Washington, D.C. last fall to testify before the International Trade Commission about the need for increased tariffs. "I testified on behalf of SolarWorld in the hopes the ITC would understand the local economic impacts that illegal dumping of foreign solar cells has had on communities like Hillsboro," the mayor said. "Last week the president took action in line with Solarworld's and my request." Trump has called for a 30 percent tariff on foreign-made solar cells, less than SolarWorld had asked for, though the company has said it will start ramping up production at its Hillsboro site. "SolarWorld is one of Hillsboro's important Enterprise Zone businesses," Callaway said. "These businesses mean a great deal to Hillsboro."